Teddy Eugene Mosiman was born October 19th, 1959 at Bethel Deaconess Hospital in Newton to Eldon & Betty (Bachelder) Mosiman. He left this earth & went to be with mom, dad, & Jesus April 9th, 2019 at the age of 59 years old. A few days after Teddy’s birth the doctors told Elly & Betty that he had down’s syndrome. This would be a challenge for them, but they persevered by raising a very loving child. When Teddy became of school age Betty took him to Newton to Northview Opportunity Center to school. A few years later he started going to Terramarra, which is now Flinthills Services, in El Dorado. He would ride the school bus with Nancy to Whitewater, then Remington, & ride the Special Ed bus to El Dorado. When he finished school he worked at the Flinthills facility making survey stakes & then putting valves in balloons for Pioneer Balloons. In 1990 there was an opening in the living facilities at Flinthills & it was offered to Teddy. He wanted to move over there & his mom & dad let him. Teddy Bear, as so many at the facility referred to him, resided at Flinthills for 29 years. Teddy had 2 families. His biological family & his Flinthills family. He loved both dearly & they all loved him. Teddy was a social butterfly. He never knew a stranger, having smiles & hugs for everyone. For many, many years he could walk into Remington High School & you’d hear Hi, Teddy, Hi, Teddy. Everyone, young & old, knew him. He was a very positive impact on the community. Some of Teddy’s favorite things to do were to go to Dean Hopkin’s Concert in the Barn & watch Mary Poppins & Sound of Music. When he would stay with Betty on weekends he would watch them over & over until she made him stop & do something else. 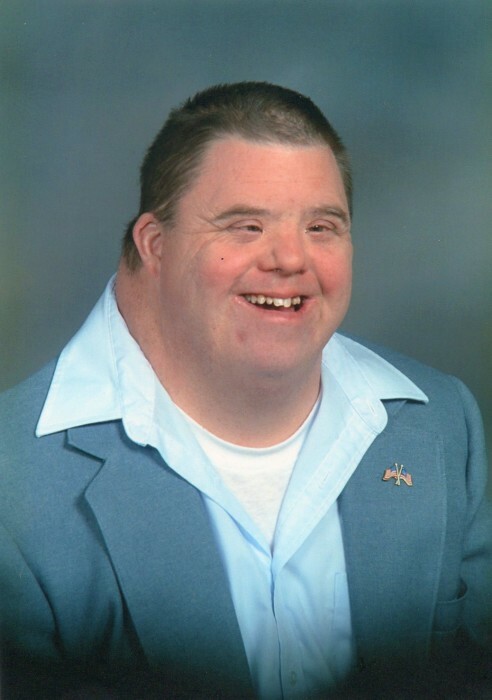 Teddy enjoyed bowling & participating in Special Olympics for many years. In March of 2016 Teddy’s mom, Betty fell, resulting in her residing at Wheatstate Manor. He would go visit her whenever he could but was always so upset seeing her in this condition. When she passed away February 2018 it devastated him. The night before he passed, Bev & Nancy stopped to see him. When she woke him up the first thing he asked about was Dean, then how he missed mama. These were the 2 things he always said to her. It’s a comfort knowing he’s finally with her again. Teddy is survived by his sister Nancy (Bev) Ayres of Cassoday, KS, nieces Jamie (Bryan) Moore of Valley Center, KS & Rachel (Troy) Darks of Edmond, OK, nephews Jason (Whitney) Schroeder of Lawrence, KS & Clint Ayres of Halstead, KS, 11 nieces & nephews Dylan, Maddie, Gary, & Maverick Moore, Tayah, Jennie Jo, & Dycen Darks, Holden, Harrison, & Aurora Schroeder, & Luke Ayres. He is preceded in death by his parents Eldon & Betty Mosiman & Uncle Willard Mosiman.